06 T. 20 Std. 02 Min. Protect your Samsung Galaxy with this Poetic License Revolution case. 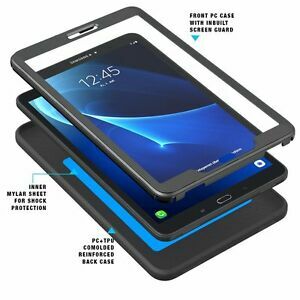 This case fits Galaxy Tab A and B devices that measure up to 10.1 inches. It is waterproof and impact-resistant to protect the device and its screen from liquids and drops against hard surfaces. The case is made from durable silicone and rubber, and it features an integrated stand to keep the tablet elevated. This protective case has a black finish and weighs 1.01 pounds.